The viewfield includes crosshairs and angle indexes. 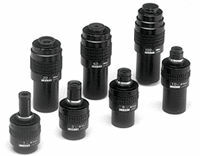 When the knurled ring at the lower section of the eyepiece tube is turned, the crosshairs and the vernier both rotate up to 180"
Note: Monocular adapter (standard equipment) is required when using these eyepieces with trinocular tubes. These compact objectives feature long working distances, excellent resolution, and all of them have almost the same parfocal distances. Can be used with MM-40/60/100B microscopes. The 3X objective comes standard with the microscope.